A partial solar eclipse occurred on July 13, 2018. A solar eclipse occurs when the Moon passes between Earth and the Sun, thereby totally or partly obscuring the image of the Sun for a viewer on Earth. A partial solar eclipse occurs in the polar regions of the Earth when the center of the Moon’s shadow misses the Earth. Part of the Moon's shadow fell near the South Pole, so partial coverage of the Sun was visible in parts of southern Australia, such as Melbourne and Geelong in Victoria, Mount Gambier in South Australia, and Hobart and Launceston in Tasmania, with highest magnitude of about 0.1. The eclipse was also visible in Stewart Island in the far south of New Zealand. 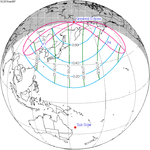 This is the second partial solar eclipse on Friday the 13th of July 2018, since the partial solar eclipse of December 1974, and the next will be the partial solar eclipse of September 2080, and the next total solar eclipse will be on July 13, 2037, 19 years later, that it is a Monday, and the next total solar eclipse will be not surpassed until the total solar eclipse of June 2132. ^ "Partial Solar Eclipse on July 13, 2018". www.timeanddate.com. Retrieved July 13, 2018. Wikimedia Commons has media related to Solar eclipse of 2018 July 13.